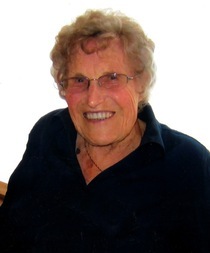 Passed away at Nipissing Manor on February 17, 2015 at the age of 91 years. Predeceased by her husband Francis. Eileen will be lovingly remembered by her daughters; Marilyn Duquette (George), Joan Adams (Bill), Karen Duquette (Glen) and Diane Debac (Albert). Cherished grandma of 13 grandchildren, 25 great grandchildren and 9 great-great grandchildren. Sadly missed by her brother Art Booth (Lois) and her brother-in-law Carl Eckensviller (Bernice-deceased). Predeceased by her parents; Thomas and Marie (nee Haufe) and her sister Alma Mallette (Gordon). The family will receive visitors at the WHISPERING PINE FUNERAL HOME (15 King St. Powassan) on Friday, February 20, 2015 from 2-4 & 7-9 pm, and on Saturday February 21, 2015 from 1 pm to 2pm, with a funeral service in the chapel at 2 pm. Interment will be held at a later date in the Commanda Union Cemetery. Donations to the Nipissing Manor Residents Fund or Charity of Choice would be gratefully appreciated by her family. Online condolences can be made at www.whisperingpinesfuneralhome.ca.